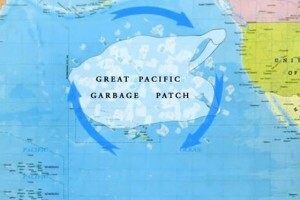 An enormous stretch of floating debris is circulating within the North Pacific Ocean. This gyre – a system of rotating ocean currents – has collected a mass of rubbish, predominantly non-biodegradable plastics and chemical sludge, and is serving to demonstrate the severity of marine pollution. 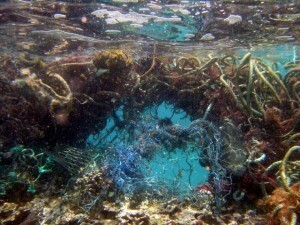 Whilst ocean trash contains rubbish from offshore ships, oil platforms and spilled shipping containers for example, the predominant source of the debris is thought to originate from land-based sources, with pollutants and plastics discarded into the oceans by rivers and coastal dumping points. Ocean currents drag this debris from the west coast of North America and the east coast of Asia into the gyre over a period of around six to a single year respectively. Whilst some larger pieces remain visible above the water, the size of the gyre is difficult to pin-down as the majority of that which it contains swills below the surface. With estimates ranging from between 700,000 to more than 15,000,000 square kilometres, scientists are comparing its size to at least two times that of Texas. This mass poses a considerable hazard to marine life whilst also impacting fishing and feeding birds. Plastic pieces become smaller and smaller, reaching a size that becomes easily ingested by marine animals. Over time, the toxic chemicals formed become so concentrated that entire food chains are affected, including humans who consume the fish that feed on smaller aquatic life. Yet the problem does not remain far out at sea. Whilst most of the rubbish sinks to the bottom of the ocean, much is washed up on shores and becomes tangled within fishing nets. Landmasses that fall in the path of the gyre become awash with large amounts of debris. Many Hawaiian Islands for example have fallen victim to such trash dumping. Various projects have been established and launched in the last several years, some of which are collaborating to identify the scale of the problem but also to come up with methods to tackle a potential clean-up. Project Kaisei, for example, started in 2009 with the aim to determine the feasibility of commercial scale recycling. In 2012, a Dutch Aerospace student unveiled a concept called The Ocean Cleanup proposing utilising the currents to carry debris into especially designed collection platforms. Whilst these and other ideas have since been uncovered, the main concern moving forward is to not only clear-up that which already exists, but to focus upon preventing the dumping of waste into the world oceans in the first place. Managing waste on land that includes more efficient recycling methods, sewage and chemical waste treatment plans and perhaps finding alternatives to plastic are all critical steps we need to make to prevent the further expansion of this and other similarly polluted oceanic gyres.